Saint Mother Teresa of Calcutta — My Catholic Life! Gonxhe Agnes Bojaxhiu was a tiny Albanian woman who used her strong-as-iron faith like a fulcrum to move the world closer to God. She was born into a devout family in Skopje, in present day Macedonia. Her parent’s marriage had been arranged, according to custom, and was happy and fruitful. The family was prosperous and regularly helped the poor and abandoned. There was seldom not a destitute person sharing the family table at lunchtime. Little Agnes benefited from the then recent reforms of Pope Saint Pius X lowering the age of First Holy Communion and thus received the Eucharist for the first time at the very young age of five and a half. After her father died young, Agnes’ firm, loving, and religious mother had the greatest influence on her. The vibrant life of her local parish also impacted her faith. The priests there talked about the missionary work of the Church in far away lands, and Agnes deeply internalized every word they spoke. Feeling the call to serve Christ and the Church, Agnes decided to become a nun with the Loretto Sisters who were based in Dublin, Ireland. So when she was eighteen, a large procession of family, classmates, and parishioners accompanied her to Skopje’s train station. After tender farewells, everyone wept and waved handkerchiefs as the train slowly pulled out of the station, and Agnes leaned out the window and wept and waved her handkerchief back at them until the train disappeared around a bend. Agnes would never see her beloved mother again. In the convent, Agnes chose the name Thérèse in honor of the Saint of Lisieux. But another nun had already chosen that name, so Agnes became Teresa, spelling the name in the Spanish style. After learning the rule of her order and basic English, she sailed on the long voyage to India, arriving in Calcutta in January 1929. India would be her home for the rest of her life. Sister Teresa taught at a girls primary school in Calcutta, taking final vows in 1937, thereafter being known as Mother Teresa. Due to her warm personality, self discipline, deep prayer life, organizational abilities, and native intelligence, she became the school principal in 1944. Everyone loved her, especially her students, and Mother Teresa was a contented nun doing important work for the Church. Her youthful zeal had been fulfilled. But then something happened to alter her life’s course, something entirely unexpected. In 1946, while riding on a train to her annual retreat, Mother Teresa received her “call within a call.” Jesus told her, by mysterious means, that He desired her to serve Him in the poorest of the poor, who were so ignorant of Him and His love. She must start a religious order. Two years of organizing passed until, in August 1948, Mother Teresa donned her famous white and blue sari for the first time. She left the comfort and predictability of Loretto and its school for a hard life among the slums of the poorest, hungriest, and dirtiest people in Calcutta. Her order, the Missionaries of Charity, was formally established in 1950 and drew its first sisters from among Mother Teresa’s former students. The order soon exploded with growth, expanding internationally, working with AIDS patients, the dying, the starving, in soup kitchens, orphanages, and directly with the poor lying in gutters. By the time of her death in 1997, the Missionaries of Charity had over four thousand sisters serving in about one hundred and twenty countries. Mother Teresa became internationally famous, an icon of charity and peace, for all the right reasons. After her death it was revealed that she struggled to feel God’s presence for much of her life, but persevered in prayer and sacrifice nonetheless. She was made of steel, always in motion, and operated on almost no food or sleep. All of her religious sisters are similarly indestructible. She was canonized by Pope Francis in 2016. 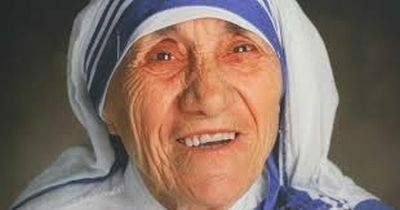 Saint Mother Teresa, your generosity to the poor and destitute inspired millions. Your life of dedication to prayer, to the Church, and to the dignity of all life, inspires us still. May we emulate your life of total service and total love by loving God first.